Jlo and Marc Anthony split, the couple have decided to end their seven year marriage in a statement to the media, "We have decided to end our marriage. "This was a very difficult decision. We have come to an amicable conclusion on all matters." Seems like they have it in the bag then, hey if it ain't working out then do what you have to do, although this seems to be a trend for Jennifer, this will be her 3 divorce. SMH. Wonder if Puffy will scoop her up and drop the imitation skeleton chic Cassie. 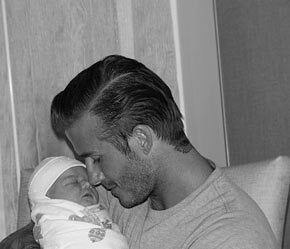 New Dad David Beckham and his daughter Harper Seven Beckham, this is to cute.